Wood chewing isn't exclusively reserved for fences. Some pony has worked on this fallen lodgepole tree. I thought I was the only one. I thought it was just my ponies that, all of a sudden and seemingly without reason, would start ravenously chewing on our wood fences. Then I read an article in Equus magazine (1), and I learned I’m not alone after all! Of course the ponies do have their reasons for this behavior. It’s my job to find out what those reasons are and if there is anything I can do to stop their destructive behavior. I was hoping the article in Equus would have some clues. My first fence chewer was my second pony. He was just two years old and had been living in a herd in a large rough pasture before coming to me to live solo in a much smaller paddock. This was before I had learned the advantages of companionship. To redirect his destructive behavior, a friend suggested cutting willow switches for him to chew on instead, which I did for several months until he settled into his new life’s routine. Occasionally, though, he will chew on wood still, so I knew that I had more to learn. I was once so desperate to redirect one pony's behavior that every evening I harvested willow switches for him to chew on. Yes, the goats often got some, too! Next I began researching and addressing possible causes for the behavior. I first ruled out cribbing because it is definitely wood chewing; it doesn’t have the air intake characteristic of cribbing. Dental issues are another possible reason for wood chewing, but that didn’t explain the behavior I was seeing either. Then I thought it was a nutritional issue. Some sources suggest that wood chewing is a phosphorus issue, and indeed sometimes the chewing would start when the ponies had run out of their loose, free-choice minerals that contain phosphorus. But the wood-chewing would sometimes happen when they had plenty of minerals. Other sources suggest that it is a copper issue. I have indeed seen less wood chewing since I started the entire herd on a regular copper supplement. But the wood chewing didn’t completely end. Then I returned to the idea that it’s a behavioral issue. Indeed one pony in particular is hardest on the fences when I am gone for most of the day. Perhaps it’s boredom after he’s cleaned up all the hay I put out for him. Perhaps it’s anxiety about my absence. But there are times when I’m gone and he doesn’t work on the fences at all. To protect my fences from being damaged, I looked into ‘paint’ that could be applied to make the rails unpalatable. I didn’t like any of the commercial products available, so I devised a mixture of neatsfoot oil and cayenne pepper. When I treat the rails with this mixture, the ponies will no longer chew on the rails. It doesn’t of course address the underlying issue, whatever that issue is. I was hopeful that the article I saw in Equus would have a solution to my fence gnawing problem. I guess I can take some solace that it didn’t have any explanations beyond what I’d already considered. What I did learn, though, is that studies have found that the behavior is typically during cold wet weather, “perhaps because of an instinctive urge for more roughage as temperatures fall.” (2) We have cold weather all winter here, but most of the time it’s quite dry (think powder snow that is coveted by downhill skiers.) It’s in the late fall and early spring that we have wet snow and cold, and indeed that’s when fence chewing is at its worst here. I tend to think the ponies are, in the fall, grieving the end of the grazing season, and in the spring, pining for the start of the grazing season! This at least gives me a possible behavioral motivation. I did run across one explanation elsewhere that was illuminating. 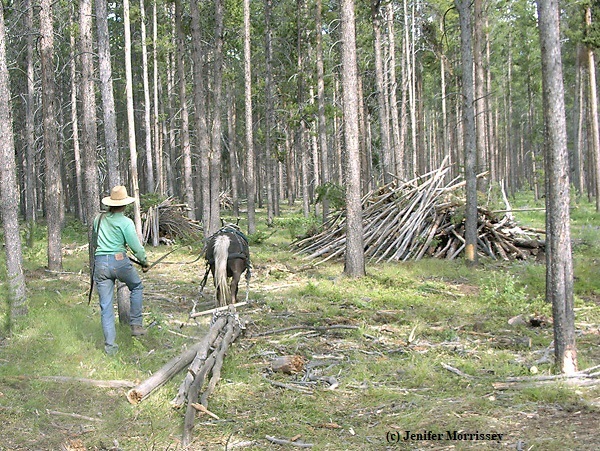 It turns out that lodgepole pine is higher in phosphorus than other woods, and equines will often choose to chew on lodgepole fences before other types of fencing. My fences are built exclusively of lodgepole, so I haven’t seen this selective chewing. It did make me wonder, though, if perhaps the ponies need even more phosphorus than they can get out of the minerals I make available to them. After seventeen years, my wood fences are in need of being rebuilt. Because our lodgepole forests have been decimated by a beetle epidemic, wood fencing materials are a little more scarce than they once were, so I’m slowly replacing the wood fences with metal. I’ll be glad that the new fences won’t be destroyed by chewing, but I’ll remain mindful that the ponies were chewing for a reason, and I need to make sure they have ways to address their needs. Frank, Katie with Melinda Freckleton, DVM. “Winter Wood Chewers,” Equus #421, October 2012, p. 11. More stories like this one can be found in my book The Partnered Pony: What's Possible, Practical, and Powerful with Small Equines, -available internationally by clicking here or on the book cover. The title of an article about some new research read “Fat Ponies Will Work for Food.” Ponies being in the title certainly caught my attention. And I’m thrilled that ponies are meriting the attention of researchers. I was, though, disappointed at the implied surprise that ponies are willing to work. Ponies of course have a long and storied working history. Nonetheless, I read the article to learn what the researchers had found. A quick internet search suggests that a dynamic feeding system isn’t readily available, but there are other ways to get ponies to do low-intensity exercise on their own. I have had great success feeding on a track system (click here and here for articles on the subject.) In the Australian study, they got the ponies to walk for two hours twice daily. My track feeding system has the ponies walking one hour four times a day. And while the researchers found benefits to physical health, I have also found that the increased movement has benefits for mental health. Although the title of the article wasn’t entirely accurate – the ponies walked for their food, they didn’t work for it - the title did do the job of enticing me to read further. And the research expanded my appreciation for the benefits of getting ponies to move on their own. It is so important for both physical and mental health that ponies move in the course of their day, either through work or being encouraged to do so otherwise. Anything that can help owners help their ponies with that objective is helpful indeed. 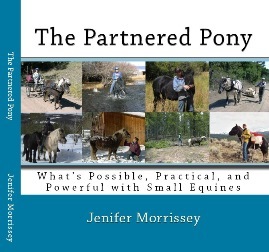 More stories about sharing life with ponies can be found in my book The Partnered Pony: What's Possible, Practical, and Powerful with Small Equines, available internationally by clicking here or on the book cover.